With the upcoming 7.0 update to its line of iOS fitness trackers, Abvio is cleaning up its act. Abvio offers a trio of GPS-enabled fitness apps for the iPhone—Cyclemeter, Runmeter, and Walkmeter—that record a wealth data about your workout. Tap your way through one of Abvio’s apps, in fact, and you can find around 150 data items covering everything from the speed of your run or ride to your heart intervals during your workout. The problem, Abvio co-founder Steve Kusmer concedes, is that data isn’t always presented in the most accessible way. That’s the primary thrust of the changes slated for the next major release to the Abvio iOS family. In version 7.0—currently on schedule for a March debut—the apps’ interface will get a revamp. Specifically, the stopwatch display in Abvio’s apps will be tightened up. The changes will allow that display to show off 30 percent more data with greater readability and contrast. More significant, multiple panes of information are available beyond the stopwatch display, which you’ll be able to access with a simple swipe. That’s not an insignificant point. Whether you’re riding a bicycle, jogging down the street, or hiking a trail, tapping a specific button can prove a bit of challenge. Swiping, however, is easy to do without ever breaking stride. The data displayed is configurable. You’ll be able to change the order of panes or even stack route maps on top of graphs if that’s what you prefer. Other features planned for the 7.0 update include a built-in music player—also available with a swipe—and a updated workout history interface. The history tab lists recent workouts with the ability to drill down to see summaries by week, month, or year. Those are about half of the features planned for the 7.0 update, according to Kusmer. 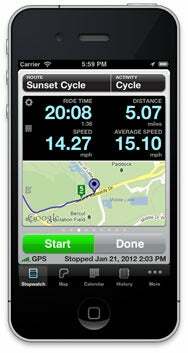 Runmeter, Cyclemeter, and Walkmeter are currently at version 6.0.2. They’re available for download at $5 each.